Deut 8:3, a photo by james veltmeyer on Flickr. This was mention by one of the guest speaker at the SMBC Preaching Conference. It's something I try and do when I preach, especially at Youth Group. Notice the movements in verse 3. God caused them to go hungry. 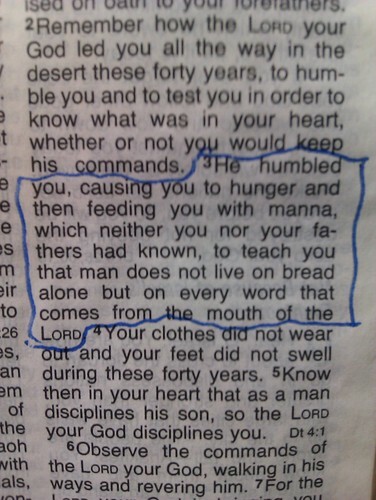 So that they might realise that man does not live on bread but the Word of God. There are things we want that we don't have. We then get them, only to realise... that wasn't what we really need.